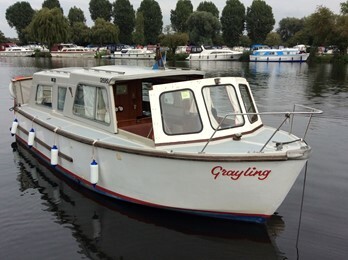 This is a well build spacious and well looked after river craft with a sliding roof and an economical diesil engine. 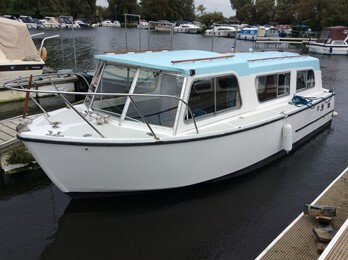 This Safari 25 was fitted out by Sutton Staithe boatyard in Norfolk as a fleet boat and has been in in private ownwership since 1994. The boat has been upgraded and improved over the years and the craft offer a fresh, tidy interior. The safari 25 is a practical low profile cruiser. The wide decks make river use easy. Level flooring throughout. 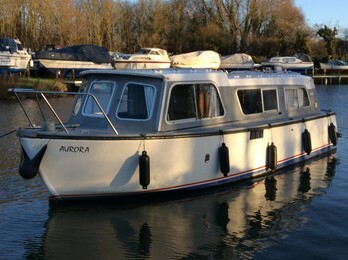 This Safari 25 was fitted by Fairburn Boats. This boat has a well presented interior. The first Safari 25s with sliding tops came out in 1968, with a later version being built, known as the sunken foredeck model, which had a sun roof rather than a sliding roof. Production of the mouldings continued until the early 80s. The hull design is a .hull with long keel lending itself to easy low speed inland waterways handling. Whilst the mouldings were produced by Hamptons, the fit outs varied enormously as many different boatyards and individuals fitted out these craft. 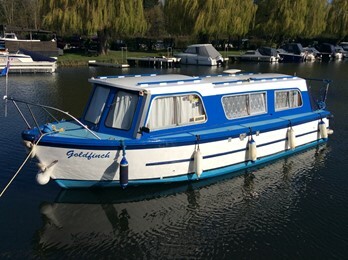 Many were successfully used as hire boats. Berthing arrangements vary from 2 to 4 berths and engines, always shaft driven, were usually Perkins or BMC diesels although different engines were always used.